Another of those popular Azimut 86S motor yachts comes on the market as Thorsten Giesbert at Fraser Yachts tells me he's signed a joint listing with his colleague Pierrik Devic on the 26.49m Ines. Designed by Stefano Righini and built in 2008 to RINA class, Ines features accommodation for ten guests in a master suite, VIP stateroom and two twin cabins (each one with Pullman) while twin 2000hp MTU engines with only 209 hours on them power her to a cruising speed of 39 knots and maximum speed of 44 knots. 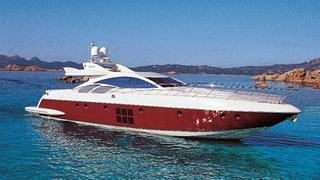 Always privately used, Ines is asking €2.95 million.